More than a dozen state lawmakers from both political parties held a press conference Thursday to oppose Central Maine Power's (CMP) proposed transmission line that would serve electricity customers in Massachusetts. 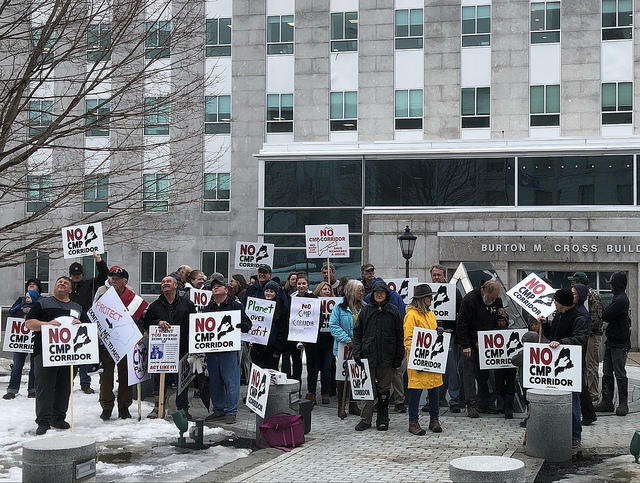 Opponents of the CMP project rallied in Augusta on March 15, 2019 (pictured). On March 28, more than a dozen state lawmakers from both political parties held a press conference to oppose the project. The event, organized by environmental and electricity-generator groups opposed to the project, is the latest signal that opposition to the project is growing. State Sen. Mark Lawrence, the Democratic chair of the Legislature's Energy Committee, says lawmakers and their constituents aren't convinced that the project or a $258 million benefits package endorsed by Democratic Gov. Janet Mills are worth it. "I think it's time the PUC puts a stop to this settlement agreement, that we take some time to look at this again, to accurately assess what, if any, benefits for Maine and what are the dangers," Lawrence says. State Sen. Paul Davis, a Republican from Sangerville, says the benefits don’t justify the potential effects to Maine's western woods. "This is a bad deal, pure and simple. And I would urge those who want to negotiate this to go back to the negotiating table and renegotiate," he said. "If we can't get a better deal than this then they shouldn't be negotiating. Period." CMP contends the project will reduce greenhouse gas emissions by utilizing hydropower from Quebec while lowering the New England region's reliance on fossil fuel for electricity, but CMP opposes a bill that would assess those climate benefits. Supporters say the settlement agreement includes millions in rate relief for low-income Mainers, money for broadband expansion and subsidies for heat pumps. Critics point out that CMP's payments would be stretched out over 40 years, greatly reducing the benefit over time. Originally published March 28, 2019 at 2:07 p.m. ET. A legislative effort emerged Thursday to put Central Maine Power's proposed billion-dollar transmission line on hold.